Mothering through breastfeeding is the most natural and effective way of understanding and satisfying your babys intense need to be with you, the beginning of a bonding relationship, the foundation for the future. For many decades, mothers all over the world have enhanced this experience with a Nursing Necklace, most frequently composed of Genuine Baltic Amber, and masterfully created to engage babys attention and focus so that feeding is beautiful, meaningful, and uninterrupted. And with good reason. As with every infant, little hands love to explore and distraction is easily accomplished. In order to ensure the best nutrition at feeding time, Amber Nursing Necklace is designed to capture your babys attention and appeal to newly developing sensitivity to touch, hearing, and vision. By encouraging your baby to explore and focus on the necklace rather than your hair or clothing, you can ensure greater satisfaction (and comfort) from these precious moments together. And if you have more than one necklace with different colors, you can create a new experience to fascinate baby by alternating them. There is no doubt in the mind of any nursing mother than babies love to pinch, pull, and tug constantly, some of which can be painful during breastfeeding. A nursing necklace not only deters your baby but redirects their busy fingers to something that wont fall apart or become damaged (such as your own jewelry). Encourage your babys attention to the necklace by raising the beads to their line of sight. The beads in genuine Baltic Amber necklaces are very carefully rounded and smoothed so that baby can enjoy touching them or even grabbing them from any angle. The play of color within Baltic amber is especially captivating, particularly where there is bright light to reflect the jewel-like colors and captivate your babys attention. Beyond breastfeeding, your nursing necklace can provide just the right focus for a variety of the activities common to you and your infant such as changing diapers, nail clipping, and even dressing your baby. These simple steps in caring for baby can be challenging but your nursing necklace can definitely improve the process and enhance it as well. Whats more, genuine Baltic amber necklaces made of perfectly sculpted beads are comfortable, lightweight, and very beautiful anytime you wear them. It is also true that genuine Baltic Amber has therapeutic qualities and serves as a completely holistic form of pain relief. While calming to babys touch, it also benefits mothers! 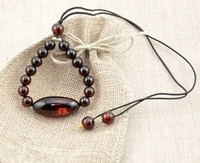 So whether youre breastfeeding for the first time or know someone who would enjoy such an incredible gift, natural Baltic Amber Nursing Necklaces can be the most important present you receive or you give yourself, a present for now and for handing down as a timeless gift to future mothers in your family.